DNP’s new DS-RX1HS digital photo printer boosts print speed by as much as 20%! Improved print speeds allow you to produce 290 4x6 prints per hour. Additional features: include improved operational support with the addition of USB iSerial for printing to multiple DS-RX1HS printers; and a new Status App for Windows OS, a helper apps to monitor you printer during operation. Other useful apps are also available for download from DNP's website. The DNP RX1HS digital photo printer combines affordable hardware and media costs with high-quality capabilities. The DNP RX1HS printer is expected to become the standard printer for demanding Photo Booth applications, delivering on-the-spot gratification while expanding your revenue stream. The beauty of the RX1HS is its small footprint weighing in at only 30 pounds, and consumes an astonishing 25% less power–in peak, idle, and running modes. Integration into existing photo booth applications can easily be made with the RX1HS. The DNP DS-RX1HS printer was designed to be the perfect printer for use in photo booths. The DNP DS-RX1HS can produce 2x6 strips right out of the box, it prints two 2x6 images on a 4x6 sheets and automatically cuts them. 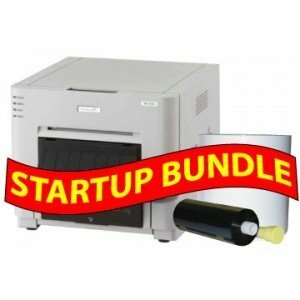 It is light weight, weighing only 30 lbs, making it very portable and at the same time it can hold up to 700 4x6 prints on one roll, making it low maintenance. The DNP DS-RX1HS has very small footprint as it is only 12.6 inches wide by 11 inches high and the front loading operation makes media replacement a synch. The DNP DS-RX1HS printer incorporates DNP's high quality, value-priced media and a high resolution printing that produces rich photos that display full color details and smooth gradation. The lamination layer on the media provides resistance to fading , fingerprints, water, ozone and dust. Designed for high performance in a compact size, the DNP DS-RX1HS is light in weight and small in footprint. The DNP DS-RX1HS printer weighs only 30 pounds and it's dimensions are 12.6 inches wide by 13.8 inches deep by 11 inches high. The DNP DS-RX1HS is capable of producing Glossy and Matt finishes from the same media, which are conveniently selectable from the printer driver. The front-loading operation on the DNP DS-RX1HS makes it easy to replace paper and ribbon, allowing the DNP DS-RX1HS printer to be used in the tightest of spaces and makes it the perfect printer for use in photo booths. The DNP DS-RX1HS operates at high speed, producing a 4x6 print in approximately 12.4 seconds. The DNP DS-RX1HS printer offers easy color adjustment via its printer driver property.